The service ‘Certificate of Completion’ helps to generate certificates by online courses or MOOC. 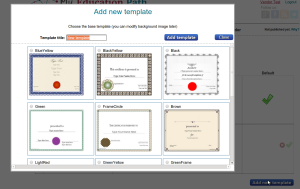 It is very easy to design a certificate template and issue certificates of completion for students/learners. 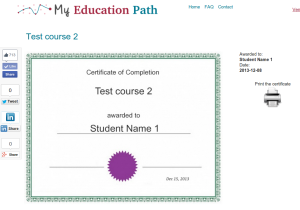 But, additionally to a traditional “download PDF and print” certificate there is also associated web page hosted on MyEducationPath.com . This web page can be easy shared with social networks. As a result, a student/learner followers will visit an online course (or MOOC) web page . 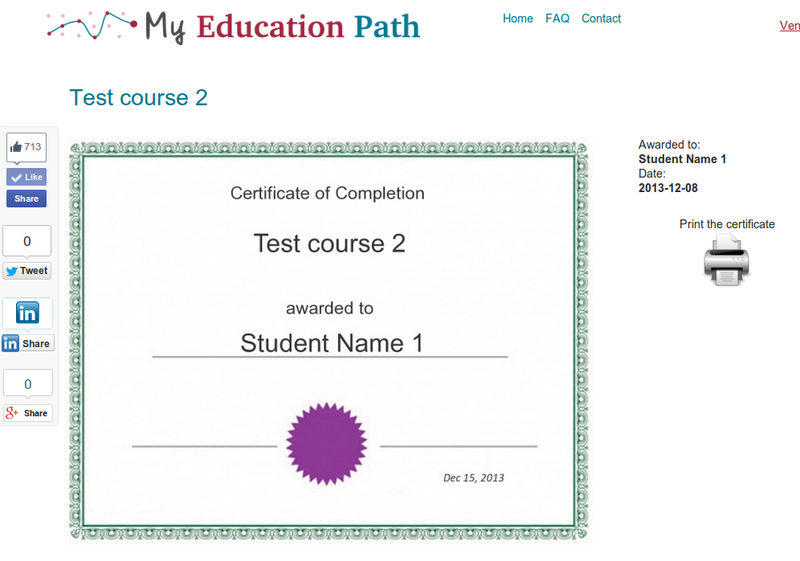 This tool helps to achieve 2 goals: issue a certificate of completion and attract new learners/students for a course. 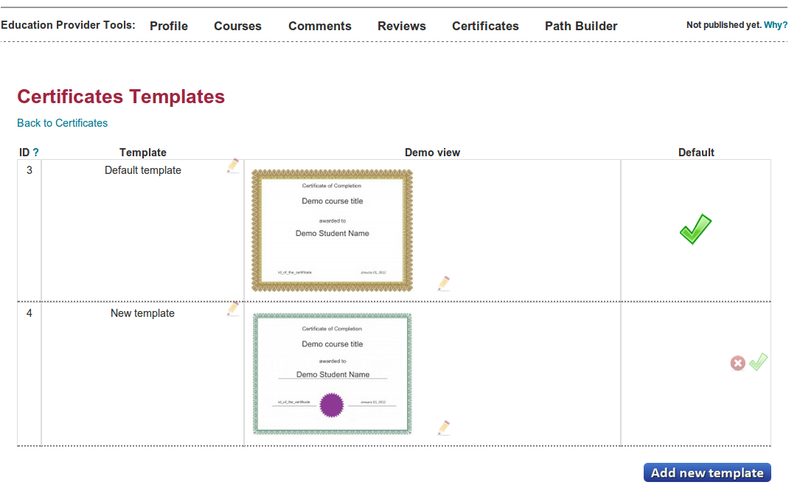 New feature has just been released – Certificates of a course completion generating. Registered education providers can issue certificate for their students. Then a student can view his certificate, print it and share with social networks. Also a student can put a certificate on his Certificates Wall and share the link to the wall to show all his certificates in one place. And, of course, a certificate can be displayed in personal Education Passport. Education Providers can use this feature right now. Just login to your Education provider account. 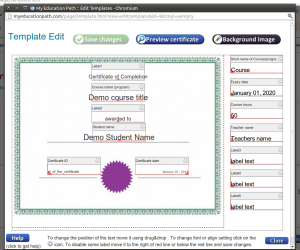 You will be able to design your certificate templates and then issue certificates to your students. Also, there is the API to integrate this feature in education provider eLearning system to issue certificate automatically. 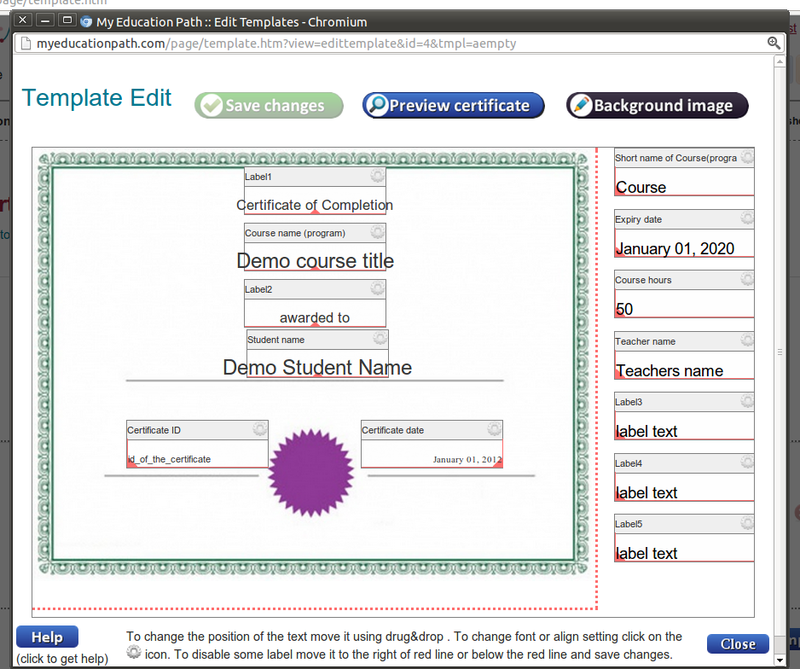 Next week we will release a Moodle plugin to issue certificates. 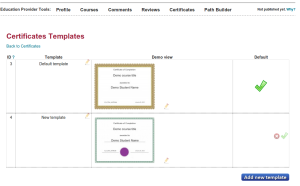 The plugin will be based on the Certificates Wall plugin but will have more features and will be upgraded to work with latest versions of Moodle. More information about Certificates of course completion. Some screenshots. We improved the Education Passport tool. Now it is possible to attach a certificate information to your passport records. Many MOOC providers issue a certificate of course completion to students. Usually this is PDF file with an image of certificate. Sometime printed certificate can be received. 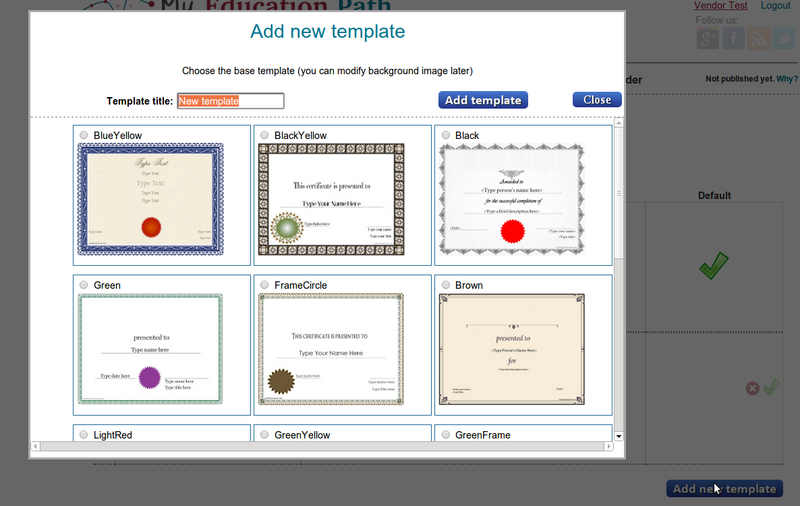 It can be very useful to share your certificates with the education passport tool. A certificate is a proof of your education. Many MOOC providers have certificate validation system. There is unique number on a certificate and this can be used to check if it is really your certificate or not. Thousands of people who completed MOOCs (Massive Open Online Courses) think about possibility to get college credits for new knowledge. MOOC providers usually don’t do certification and it is not possible to earn credits. For example, Coursera help says it is not possible. However, there are independent organizations who can assign credits based on examinations. Such examination can be called “Get credit for what you already know”. Recently, we launched the functionality to connect certification exams to MOOCs to find easy relevant exams. Now we created new tool to see all relevant exams for all MOOC provider courses on one page. The tool is there – Find certification exams for MOOCs and online courses. Other interesting tool we launched recently is alternatives listing of courses of a specified provider. See there Find alternatives to MOOCs and online courses. And the last one new tool is the tool to find courses to prepare to certification exams. It does reverse work to the first tool. Prepare to certification exams using MOOCs and online courses. MyEducationPath.com aims to force changes to higher education to make it more affordable. We try to join different parts of new movements in this area, create integrated system and, as result, get new alternative to traditional higher education. MOOCs do good job in this process. But MOOCs are not enough to replace traditional higher education. For last time a new round of changes started – this are accreditation service that works with the model “get college credit for what you already know”. There are couple colleges/universities where it is possible to pass an exam and get credit for low cost. We started partnership with Excelsior College to help MOOCs students to find a way to convert their new knowledge to college credits. We listed exams from Escelsior College and mapped MOOCs to every exam which can be used to prepare to an exam. Now MOOCs students can find their courses in our MOOCs and Online courses directory and see what exams can be used for certification and getting credits. For example, it is possible to use the exam English Composition after completing of the course English Composition I: Achieving Expertise to get college credits. Of course, examination is not for free. Prices are from $95 to $405. However, this is much cheaper then traditional education when you pay also for courses learning. Having the exams listing and the courses listing allows us to build very important thing – education paths to achieve degrees assigned with a college. Such education will be really cheap and, as result, a student will get official diploma from a college where he converted his knowledge to credits. The idea is – a student learns MOOCs for free and passes examinations on a subjects he learnt till all required credits are received to get a diploma. There is good example of such education path. Bachelor of Science in Business from Excelsior College. Before every exam a student can learn one of offered online courses (most of them are free). For every subject there are from 2 to 8 alternatives of online courses. A student can choose from alternatives bases on feedback from other students and ratings. The path can be completed in 3 years and will cost approximately $5000 to pass all exams. As result, when all exams are successfully passed the degree will be assigned. Soon, we will get more partners who can do examination for “what you already know” and assign college credits. Follow our updates to know when this happens. We would greatly appreciate your feedback about the education path Bachelor of Science in Business. You can leave your comments on the path page. Do you think it will work and can be alternative to incredibly expensive traditional higher education?